Hi, friends. August is a super busy month for me. Had to rush and complete a few big orders for Teacher's Day gifts. So busy and tired that I miss my own crafting time!!! So glad its over and I can start to play!! This month at Off The Rails Scrapbooking, we had a delicious mood palette challenge. Do hop over here and join us in the challenge. For for DT assignment this month, I created a small mixed media canvas. I used our Sep Mood Palette as inspiration. Wanted to create something with a meaning of "out of the old comes new life". 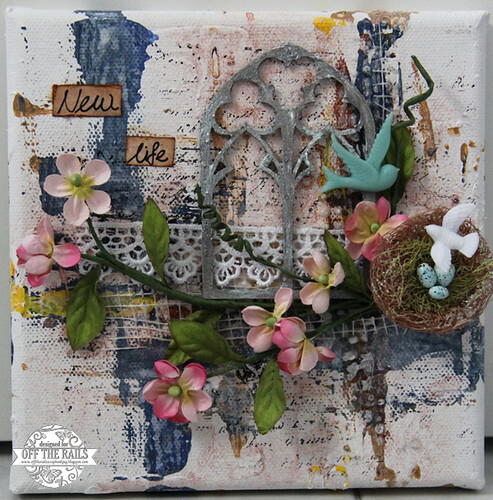 Hence the window and background depicts the old and the flower vines, birds and bird nest and eggs depict new life. For more details, do hop over to Off The Rails Scrapbooking. An adorable LO. Love all the texture with a beautiful bird nest!!! Awesome canvas art. Those blooms and embellishments looks great.